After eight years of fraught relations with Seattle, Amazon carefully laid out a few bonuses it will bring Long Island City in its long-awaited HQ2 announcement. There were no specifics provided regarding community perks for Arlington County, Virginia, its other new headquarters location. Amazon will donate land for a new grade school near its new Long Island City, Queens, campus in New York, the company said Tuesday, in what is perhaps the largest perk it is providing to the communities surrounding its new headquarters — apart from tens of thousands of new, high-paying jobs and real estate investments. But the community benefits it’s offering upfront to the New York neighborhood could also be seen as token moves, especially since the company is getting $1.5 billion in incentives for moving to the site. Amazon carefully laid out the bonuses it will bring to Long Island City in its long-awaited HQ2 announcement Tuesday, including space for artists and a tech-startup incubator in its New York location. There were no specifics provided regarding community perks the company has promised to Arlington County, Virginia, its other new headquarters location. Amazon’s often-stressed relationship with Seattle over the past eight years — as it grew from 5,000 local employees to 45,000 — likely informed these perks, and the decision to choose two huge cities that are already centers of industry. “We’re a different company than we were 10 years ago,” said Jay Carney, Amazon’s senior vice president who oversees Amazon’s communications and government affairs group. Still, not everyone in Amazon’s hometown appreciates the company’s rapid growth, or its presence in downtown Seattle. Amazon is often the target of those who bemoan the fading of Seattle’s proud grungy, artistic, blue-collar vibe. Flyers stapled to light posts curse techies, and likenesses of CEO Bezos spray-painted on the street with unfavorable slogans mark many spots on Capitol Hill. Amazon also gets blamed for housing prices, which have skyrocketed in the past five years, and for the growing income inequality in the city. Others staunchly defend the tech giant, pointing to the thousands of jobs, dozens of related businesses and overall economic growth the company has brought. Those economic benefits were the focus of Amazon’s headquarters unveiling Tuesday, when the company laid out the prospect of tens of thousands of jobs and billions in investment and tax revenue it pledges to bring to each region. But it also offered a few softer benefits: space for a primary or intermediate-grade public school in Long Island City, as well as space for artists, industrial businesses and a tech startup incubator at the site. In its Arlington County location, the perks mainly come from the state not the company. The commonwealth of Virginia will invest $195 million to improve infrastructure in the neighborhood, Amazon said, including a pedestrian bridge linking the site to Reagan National Airport. Virginia Tech also said it would invest $1 billion in a graduate “innovation campus” near the site, as part of the higher-education benefits Virginia pledged to Amazon. “Absolutely, we have already, and will continue to engage with the communities, with local leaders as we grow in each place,” Carney said. In a survey this spring, Elon University found that 76 percent of New York residents either strongly supported or somewhat supported Amazon’s HQ2 coming to their city. 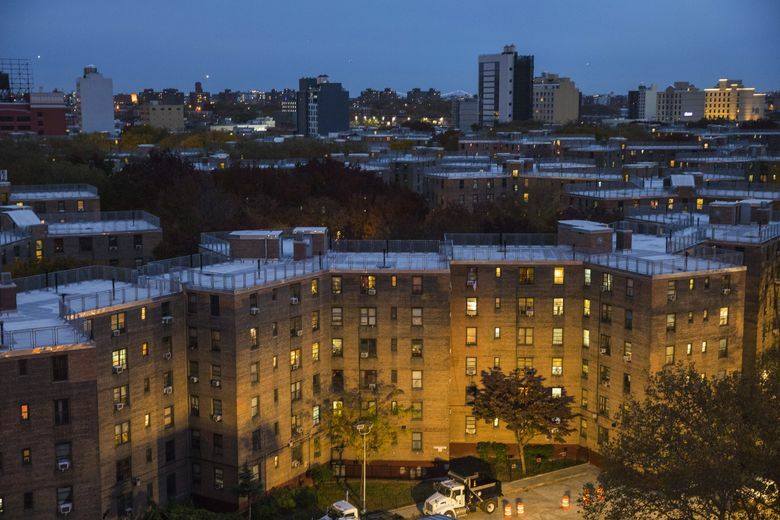 But they may not have been planning on this precise location — where nearly 60 percent of residents in nearby Queensbridge Houses, the nation’s largest public housing project, make use of food stamps, according to The New York Times. Amazon will spend $5 million on job training and other workforce development for people living near its new site, and will hold job fairs and workshops at Queensbridge Houses. But some critics, concerned about the impact on the neighborhood of one of the world’s largest companies and its highly paid employees, are vowing to protest. Opposing the measure, Amazon halted construction on new buildings and suggested it would significantly slow growth, effectively holding the city hostage. Amid outcry from construction workers and business groups, as well as polls suggesting voters would not support the measure, the tax was eventually repealed. But the lingering tension of the frayed relationship remained. Bezos, the world’s richest man, announced later this fall his plans to commit $2 billion nationally to causes that benefit family homelessness and early childhood education — his biggest philanthropic pledge yet. Seattle Times business reporter Matt Day contributed to this report. Will Amazon’s HQ2 sink Seattle’s housing market? Cities and states offered Amazon billions, but did it matter? Read more about Amazon and its HQ2 plans.